If you have basic Python skills and wish to learn in depth how to correctly apply appropriate design patterns, this course is tailor made for you. Python is an object-oriented scripting language that is used in everything from data science to web development. Through applying essential software engineering design patterns to Python, Python code becomes even more efficient and reusable from project to project. 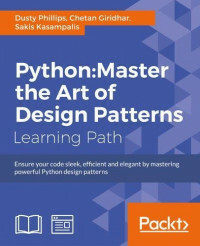 This learning path takes you through every traditional and advanced design pattern best applied to Python code, building your skills in writing exceptional Python. Start with the bedrock of Python programming – the objectoriented paradigm. Build your confidence as you learn Python syntax, and how to use OOP principles with Python tools such as Django and Kivy. In the second module, run through the most common and most useful design patterns from a Python perspective. Enhance your professional abilities in in software architecture, design, and development. In the final module, run through the more complex and less common design patterns, discovering how to apply them to Python coding with the help of real-world examples.